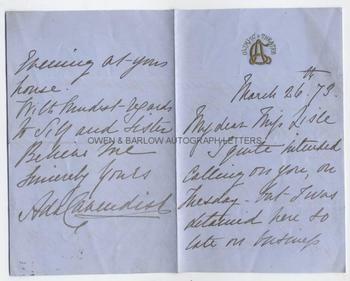 ADA CAVENDISH Autograph Letter Signed. British (English) Shakespearian actress and theatrical producer. Known for her roles in the plays of Wilkie Collins, which she did much to popularize. ALS. 4pp. 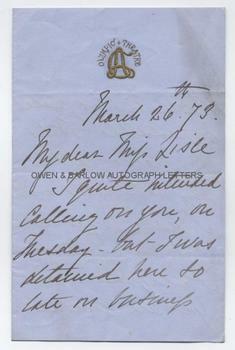 March 26th 1873. Gold embossed letterhead of Olympic Theatre. To Miss Lisle. 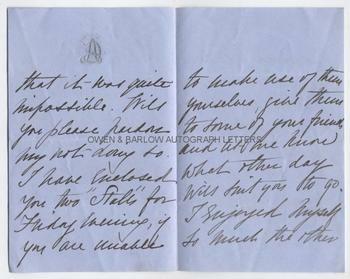 "I quite intended calling on you, on Tuesday - but I was detained here so late on business that it was quite impossible. Will you please pardon my not doing so. I have enclosed you two "stalls" for Friday evening, if you are unable to make use of them yourselves, give them to some of your friends and let me know what other day will suit you to go. I enjoyed myself so much the other evening at your house. With kindest regards to self and sister." Ada Cavendish made her stage debut in 1853 on the musical burlesque stage. She quickly made a name, however, in the serious theatre and became known for her Shakespearian roles, such as Juliet and Rosalind. She will probably be most remembered as the actress who created the lead roles in Wilkie Collins's plays Armadale and The New Magdalen. She was given exclusive rights by Collins and both starred in and produced the first performance of The New Magdalen at the Olympic Theatre in May1873. She later toured with the plays in America and was instrumental in bringing Wilkie Collins to a wider audience.